KEZI: On the last day of their session legislators approved nearly $240 million in state-issued bonds for the reconstruction of both UO’s recreation center and the Erb Memorial Union. 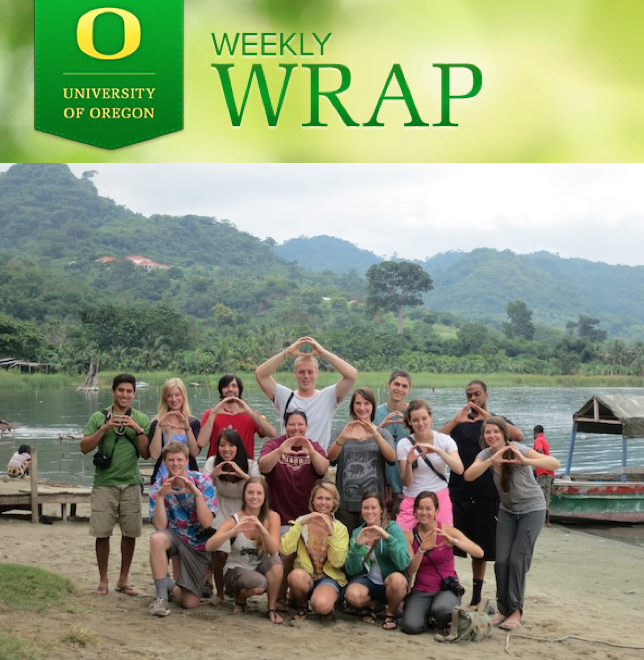 Celebrating Champions: Sixteen University of Oregon journalism students are spending part of their summers in Ghana, working as interns for news organizations, advertising and PR agencies and non-governmental organizations in the West African nation. AroundtheO: President Gottfredson presented Helmuth Rilling, Oregon Bach Festival artistic director, with the University of Oregon Presidential Medal following his final concert on July 14. AroundtheO: UO math professor Dev Sinha is putting his national Common Core development into play at the local level, giving Lane County math teachers hands-on training in the new standards that will bring Oregon students up to speed in math ability. AroundtheO: The Jordan Schnitzer Museum of Art hosts a free, outdoor screening of Jean-François Laguionie’s animated film, “The Painting,” at 8:30 p.m. July 24. CBS: The CBS Sports' “Best of College Sports” series looks at the Ducks’ rise to the elite level.